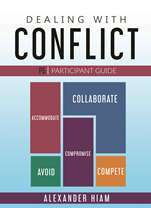 The Participant Coursebook follows the Leaders Guide and includes key summary information, exercises, worksheets and activities needed by participant to master conflict resolution skills. Module 1 explores the high costs of organization conflict and the importance of adopting a negotiating posture to resolve most business conflict. Module 2 covers the importance of understanding your dominant conflict style as your default style when under the pressures that conflict often exerts. Module 3 explains the two motivating forces that often determine an individuals approach to conflict: Concern for the outcome & Concern for the relationship. Participants learn to make situational decisions. Module 4 covers measuring and improving your conflict IQ and how to improve how you resolve conflict. Module 5 teaches advanced negotiating skills useful with the collaboration and compete styles of conflict resolution and included best practices for trust building, listening, creative thinking, and anger management.